Our Canadian boating vacations are the perfect way to discover the beauty of the Rideau Canal. One of the greatest engineering feats of the 19th century, the Rideau Canal is the oldest continuously-operated canal system in North America. 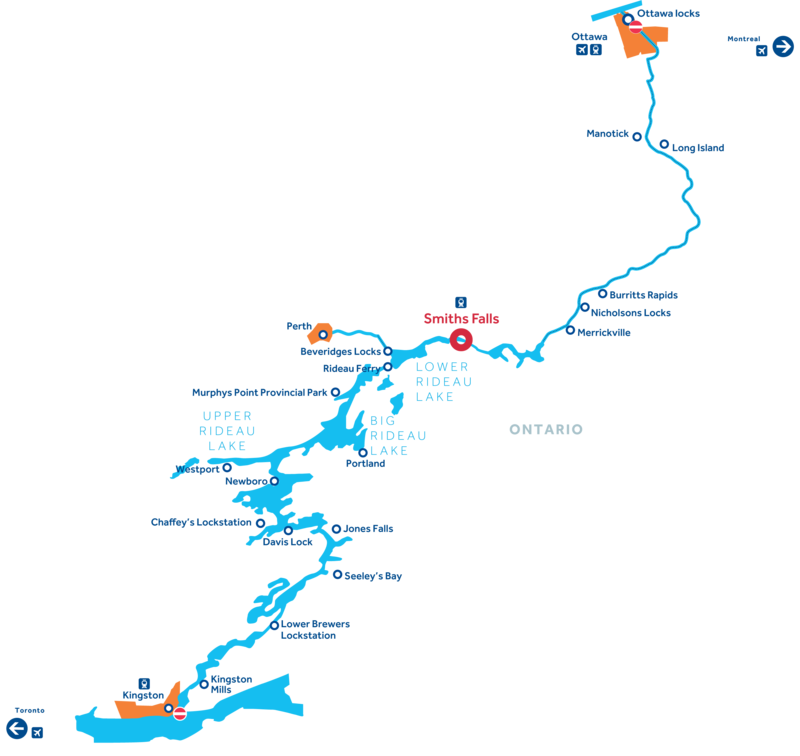 Traveling this attractive waterway, you'll be able to unwind and take in the spectacular nature, picturesque towns and lively cities of this UNESCO World Heritage Site. Discover more about Canada and the unique charm of each region of our cruising ground. The lakes and rivers of the Rideau Waterway offer great fishing opportunities including Largemouth Bass, Smallmouth Bass, Northern Pike, Lake Trout, Yellow Perch, Black Crappie and Walleye. Nature lovers will enjoy their journey through the Rideau, which provides a haven for many species of wildlife. Bicycle enthusiasts can fully enjoy the Rideau region. Although there are no bicycle trails directly along the Rideau, there are many trails and secondary roads close by that bicyclists can enjoy. All the cities along the Canal offer shopping opportunities. Check out the local products and crafts shops. Don't leave Canada without a bottle of maple syrup. As it winds its way 202km (125 miles) from Ottawa to Kingston, the Rideau Canal is bursting with new experiences just waiting to be explored. Whether you like taking in abundant nature, discovering fascinating culture or simply indulging in some of the finer things - the Rideau Canal has something for you! Originally intended as a military supply route between Montreal and Kingston in the event of an American invasion of Canada. Construction of the canal, under the charge of Lt. Colonel John By, began in 1826 through a wilderness of rough bush, swamps and rocky terrain. 19th century working conditions were grueling and the work was done by hand. An estimated 1,000 men died during the six years of construction. Today, the Rideau Canal is one of North America’s most beautiful navigable waterways, with exquisite stone-masonry admired to this day. Our Canada cruises are perfect for that short escape or epic expedition. Our base is located in Smiths Falls, midway along the canal, and is the perfect starting point for long or short breaks. So whether you have a few days or several weeks, our Canada cruises are the perfect standalone vacation or accompaniment to a wider break. 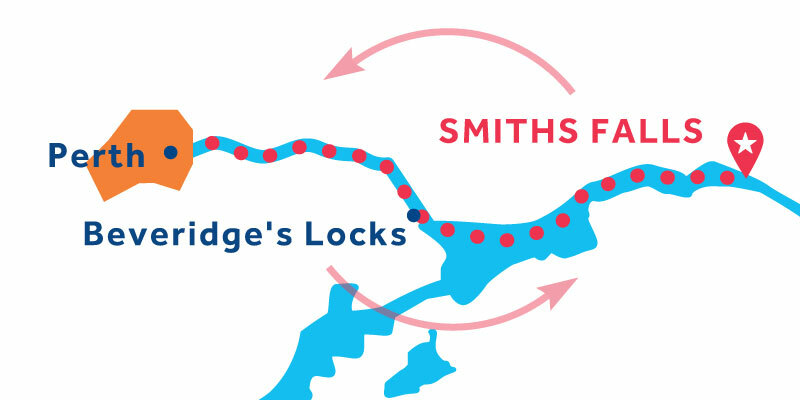 There are 24 Lockstations and 47 Locks on the Rideau. Each lock has 3 to 4 staff members to help out in any way they can. 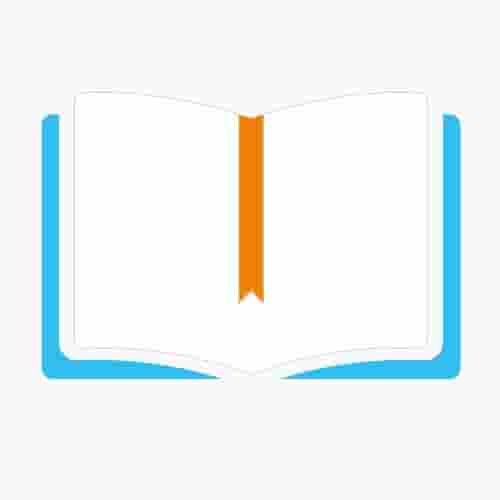 Monday to Thursday 10:00 a.m. - 4:00 p.m. Friday to Sunday and holidays 9:00 a.m. - 7:00 p.m.
Monday to Thursday 9:00 a.m. - 6:00 p.m. Friday to Sunday and holidays 9:00 a.m. - 7:00 p.m.
Monday to Friday 10:00 a.m. - 4:00 p.m. Saturday, Sunday & Thanksgiving 9:00 a.m. - 5:00 p.m. There are many options for overnight moorings along the Rideau; private marinas, township marinas and Parks Canada moorings (situated at lock stations) all provide overnight moorings for a fee, with varying facilities and services. However, a mandatory fee of $70 USD / $75 CAD for short breaks or $110 USD / $120 CAD for 7nts+ will be charged to Le Boat customers and covers overnight moorings at all Parks Canada sites, as well as the township marinas of Portland, Seeley’s Bay, Perth and Westport – a significantly reduced rate than the fee charged locally at each of these moorings sites. All overnight moorings are operated on a first-come, first-served basis and exclude services such as shore power. Canada’s capital has at its center Parliament Hill, with grand Victorian architecture and museums like the National Gallery of Canada, with noted collections of indigenous and other Canadian art. The park-lined Rideau Canal is filled with boats in the summer. Historic Byward Market and old town is near the canal and offers a wide choice of restaurants, shopping and outdoor entertainment. Manotick is a charming town with plenty of restaurants and shops to keep you entertained. A highlight is Watson’s Mill, a fascinating working museum that is one of the only remaining grist mills in North America. Long Island Locks is an idyllic location for picnicking, fishing, exploring and boat watching. Tie up at Burritts Rapids Lock Station, then take a walking tour of the village and experience early Canada through centuries old heritage buildings or walk the "Tip to Tip Trail", a 2 km nature walk. For historians and bird-watchers this is a great place to visit. Upper Nicholsons features one of four remaining Unequal Arm, a center bearing timber swing bridge, on the Rideau. Then just up the road you’ll discover McGuigan’s Cemetery (448 County Road 23, aka Burritts Rapids Road), one of the oldest burying grounds on the Rideau. You will be touched by the poignant headstone of Margaret Davidson, the 2 year old daughter of one of the contractors for Clowes Lock, who died in 1829. Merrickville is Canada’s prettiest village. The village center consists entirely of picturesque Victorian-era stone houses perched by the waters of the Rideau Canal. Merrickville is home to many local arts and craft shops, museums, restaurants and specialty stores serving some of the best local handmade ice cream or gourmet mustards on the Rideau Canal. Located in the Heart of Eastern Ontario on the banks of the historic Rideau Canal, Smiths Falls offers a unique mix of leisure and recreational activities set against a backdrop of history and nature. Smiths Falls has a rich heritage, and today offers museums, theaters, art galleries and outdoor adventures including hiking, biking and fishing. When the Rideau Canal was built, there was no water connection to Perth, so the residents constructed the Tay Canal. This area is known as "Haggart's Ditch" and features some of the best wildlife viewing on the Rideau on the way to Perth. Linked to the Rideau Canal via the Tay Canal, Perth is a beautiful 200 year old town renowned for it's limestone architecture. The town has something for everyone: festivals and events, canoeing, kayaking, cycling, hiking, trail-riding, museums, genealogy, camping, heritage inns, provincial parks, conservation areas, golfing, horse riding, artisans, farmer's markets, great harvest foods, docking facilities, shopping and studio tours. Perth has a wide variety of restaurants and unique boutiques. Straddling a thin strip of water between the Big and Lower Rideau Lakes, Rideau Ferry is the spectacular scenic gateway to the southern Rideau. A hub for live music and festivals throughout the summer, stop here for the biannual Vintage Boat Regatta first held here in 1897. Portland is a small village located on Big Rideau Lake.There are many things for the landlubber to see and do in the Portland area. There are several unique stores in town, including antiques and collectables. The Cataraqui all-season trail passes just a bit east of town, golf courses are located nearby, one of the local B&Bs offers horseback riding, and cheese lovers will want to visit local cheesemakers and wineries. Westport is a charming village. There you will find public docking facilities and a full range of land-based accomodations. The city offers a lot of activities: shops, two golf courses and swimming beaches. Nature lovers will be able to enjoy a hike in Foley Mountain Conservation Area which has spectacular views of the area. The Village of Newboro is a popular destination spot for anglers wishing to land one of the big Largemouth Bass that populate Newboro Lake. It is also a popular stop for boaters since Newboro is located adjacent to the Newboro Lockstation on the Rideau Canal. It's a good spot to restock supplies or have a quiet lunch or dinner at one of the local restaurants or inns. Be sure not to miss Kilborn’s, a unique shopping experience located in the heart of historic Newboro and the adjacent dining room in an original 1832 residence. Chaffey's Lockstation stands on beautiful isthmus of land lying between Indian Lake and Opinicon Lake. The Chaffey's Lock and Area Heritage Society was formed in 1980 to oversee the development of the Lockmaster's House Museum and to preserve the heritage of the village and surrounding area. Jones Falls must be one of the prettiest lockstations along the Canal. The lockstation is home of the "Great Stone Arch Dam". 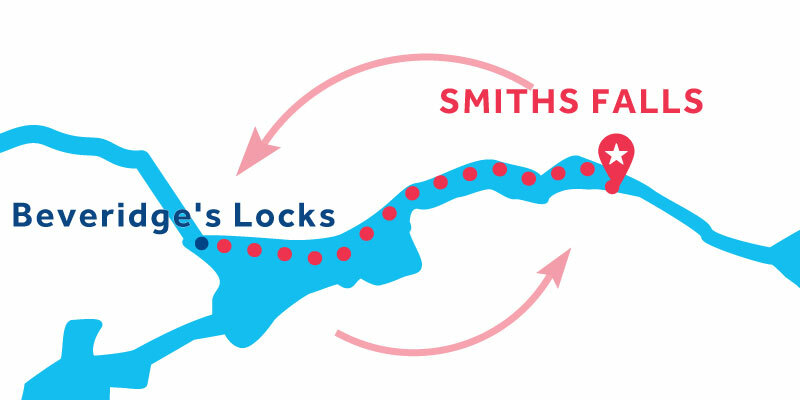 Jones Falls has a flight of 3 lower locks. The turning basin separates the locks from the upper lock. This is the highest lift of any lockstation on the canal. Seeley's Bay is a charming town with a great community park with playgrounds, tennis courts and picnic tables. Here you’ll be delighted to discover a little sliver of the region’s history at the Tepee in Centennial Park (just up Bay Street from the moorings). This modern day tepee commemorates the original Tepee of ‘Granny Seeley’, who ran a trading post and conducted business with Aboriginals and European settlers during the 1800s. This is the site of the first mill built on the Rideau, the King’s Mill, built here at Cataraqui Falls in 1784. The site today features a lovely set of three locks, a turning basin, a detached upper lock and the Robert Anglin Visitor’s Centre. Kingston Mills Falls is located on the outlet of Colonel By Lake, an artificial lake created by the damming of the Catraqui River. The falls is just below the dam. Kingston is located on Lake Ontario at the mouth of the southern end of the Rideau Canal. It's known as the "Limestone City" for its grand 19th-century buildings, including the lakeside Kingston City Hall. The grand house and gardens of the Bellevue House National Historic Site commemorate Canada's first Prime Minister, Sir John A. Macdonald. Fort Henry, built in the 1800s, holds military demonstrations throughout the summer and is the site of a fabulous rooftop restaurant providing a panoramic view of the beautiful historic city and the Saint Lawrence River. Along the Rideau you'll discover an abundance of wildlife. With Beavers, Otters, Turtles, Ospreys and the famous Canada Geese just some of the fantastic fauna you be able to spot while you drift gently along the Rideau. So remember your binoculars and camera, because this region is a nature lovers dream. Smiths Falls: Located in the Heart of Eastern Ontario on the banks of the historic Rideau Canal, Smiths Falls offers a unique mix of leisure and recreational activities set against a backdrop of history and nature. Smiths Falls has a rich heritage, and today offers museums, theaters, art galleries and outdoor adventures including hiking, biking and fishing. Beveridge's Locks: When the Rideau Canal was built, there was no water connection to Perth, so the residents constructed the Tay Canal. This area is known as "Haggart's Ditch" and features some of the best wildlife viewing on the Rideau on the way to Perth. Canada is a paradoxical place, able to combine pristine wilderness with vibrant local culture. Find yourself taking in the natural wonders of Ontario as you make your way gently down the Rideau before unearthing the lively local culture of Perth with its quaint boutiques and lively markets. Perth: Linked to the Rideau Canal via the Tay Canal, Perth is a beautiful 200 year old town renowned for it's limestone architecture. The town has something for everyone: festivals and events, canoeing, kayaking, cycling, hiking, trail-riding, museums, genealogy, camping, heritage inns, provincial parks, conservation areas, golfing, horse riding, artisans, farmer's markets, great harvest foods, docking facilities, shopping and studio tours. Perth has a wide variety of restaurants and unique boutiques. Picturesque Victorian stone houses, local craft shops and a thriving artisan community. It is easy to see why Merrickville was voted Canada's most beautiful village. Let yourself wander around this chocolate-box town and delve deeper into this regions charming local culture. Merrickville: Merrickville is Canada’s prettiest village. The village center consists entirely of picturesque Victorian-era stone houses perched by the waters of the Rideau Canal. Merrickville is home to many local arts and craft shops, museums, restaurants and specialty stores serving some of the best local handmade ice cream or gourmet mustards on the Rideau Canal. A short cruise to explore the Southern end of the Rideau Canal and the lively city of Kingston. Let yourself enjoy wide lakes and wild scenery as you head down to Kingston, where the Southern Rideau meets the mighty Lake Ontario. Seeley's Bay: Located in the Heart of Eastern Ontario on the banks of the historic Rideau Canal, Smiths Falls offers a unique mix of leisure and recreational activities set against a backdrop of history and nature. Smiths Falls has a rich heritage, and today offers museums, theaters, art galleries and outdoor adventures including hiking, biking and fishing. Kingston Mills: This is the site of the first mill built on the Rideau, the King’s Mill, built here at Cataraqui Falls in 1784. The site today features a lovely set of three locks, a turning basin, a detached upper lock and the Robert Anglin Visitor’s Centre. Kingston Mills Falls is located on the outlet of Colonel By Lake, an artificial lake created by the damming of the Catraqui River. The falls is just below the dam. Kingston: Kingston is located on Lake Ontario at the mouth of the southern end of the Rideau Canal. It's known as the "Limestone City" for its grand 19th-century buildings, including the lakeside Kingston City Hall. The grand house and gardens of the Bellevue House National Historic Site commemorate Canada's first Prime Minister, Sir John A. Macdonald. Fort Henry, built in the 1800s, holds military demonstrations throughout the summer and is the site of a fabulous rooftop restaurant providing a panoramic view of the beautiful historic city and the Saint Lawrence River. A short cruise perfect for those who want to explore the vast open lakes, small-town charm and the breath-taking nature of the central Rideau without re-tracing your steps. There is plenty to see-and-do along this stretch of the waterway, making this the perfect cruise for those who want to pack their days with adventure! Jones Falls: Jones Falls must be one of the prettiest lockstations along the Canal. The lockstation is home of the "Great Stone Arch Dam". Jones Falls has a flight of 3 lower locks. The turning basin separates the locks from the upper lock. This is the highest lift of any lockstation on the canal. Chaffey's Lockstation: Chaffey's Lockstation stands on beautiful isthmus of land lying between Indian Lake and Opinicon Lake. The Chaffey's Lock and Area Heritage Society was formed in 1980 to oversee the development of the Lockmaster's House Museum and to preserve the heritage of the village and surrounding area. Newboro: The Village of Newboro is a popular destination spot for anglers wishing to land one of the big Largemouth Bass that populate Newboro Lake. It is also a popular stop for boaters since Newboro is located adjacent to the Newboro Lockstation on the Rideau Canal. It's a good spot to restock supplies or have a quiet lunch or dinner at one of the local restaurants or inns. Be sure not to miss Kilborn’s, a unique shopping experience located in the heart of historic Newboro and the adjacent dining room in an original 1832 residence. Westport: Westport is a charming village. There you will find public docking facilities and a full range of land-based accomodations. The city offers a lot of activities: shops, two golf courses and swimming beaches. Nature lovers will be able to enjoy a hike in Foley Mountain Conservation Area which has spectacular views of the area. Portland: Portland is a small village located on Big Rideau Lake.There are many things for the landlubber to see and do in the Portland area. There are several unique stores in town, including antiques and collectables. The Cataraqui all-season trail passes just a bit east of town, golf courses are located nearby, one of the local B&Bs offers horseback riding, and cheese lovers will want to visit local cheesemakers and wineries. Rideau Ferry: Straddling a thin strip of water between the Big and Lower Rideau Lakes, Rideau Ferry is the spectacular scenic gateway to the southern Rideau. A hub for live music and festivals throughout the summer, stop here for the biannual Vintage Boat Regatta first held here in 1897. Beveridges Locks: When the Rideau Canal was built, there was no water connection to Perth, so the residents constructed the Tay Canal. This area is known as "Haggart's Ditch" and features some of the best wildlife viewing on the Rideau on the way to Perth. Gently cruise the vast lakes, mighty forests and hidden islands of the Southern Rideau. The perfect playground for any lover of the outdoors. Find yourself paddling the Big Rideau Lake, going on a hike in Foley Mountain Conservation Area or playing golf on one of Portland’s two golf courses. Sometimes the best things in life are those little luxuries. Discover them with a cruise on the Northern Rideau. Combine some retail therapy in Canada’s prettiest village, Merrickville, with a visit to one of Canada’s top gardens, the Rideau Woodland Ramble in Burritt’s Rapids. Paradise is real, and you'll find it here! Upper Nicholsons: For historians and bird-watchers this is a great place to visit. Upper Nicholsons features one of four remaining Unequal Arm, a center bearing timber swing bridge, on the Rideau. Then just up the road you’ll discover McGuigan’s Cemetery (448 County Road 23, aka Burritts Rapids Road), one of the oldest burying grounds on the Rideau. You will be touched by the poignant headstone of Margaret Davidson, the 2 year old daughter of one of the contractors for Clowes Lock, who died in 1829. Burrits Rapid: Tie up at Burritts Rapids Lock Station, then take a walking tour of the village and experience early Canada through centuries old heritage buildings or walk the "Tip to Tip Trail", a 2 km nature walk. Long Island: Long Island Locks is an idyllic location for picnicking, fishing, exploring and boat watching. Wesport: Westport is a charming village. There you will find public docking facilities and a full range of land-based accomodations. The city offers a lot of activities: shops, two golf courses and swimming beaches. Nature lovers will be able to enjoy a hike in Foley Mountain Conservation Area which has spectacular views of the area. Seeley's Bay: Seeley's Bay is a charming town with a great community park with playgrounds, tennis courts and picnic tables. Here you’ll be delighted to discover a little sliver of the region’s history at the Tepee in Centennial Park (just up Bay Street from the moorings). This modern day tepee commemorates the original Tepee of ‘Granny Seeley’, who ran a trading post and conducted business with Aboriginals and European settlers during the 1800s. 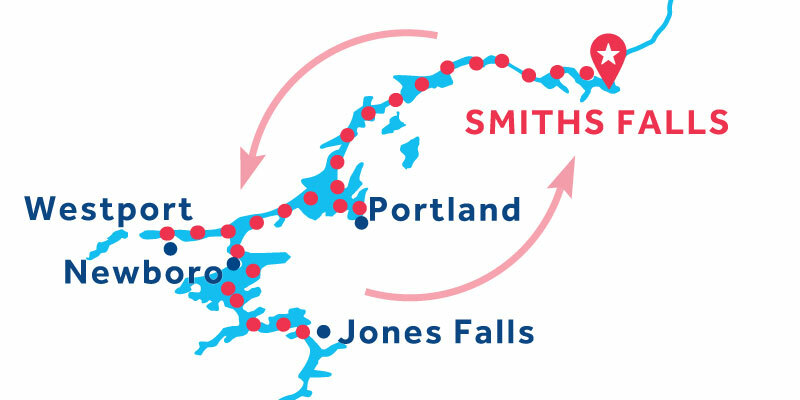 A week long one-way cruise, which takes you from Smiths Falls on the central Rideau down to Seeley’s Bay via the city of Kingston at the Rideau’s southernmost tip. Cruising through the Rideau’s most beautiful lakes you’ll have plenty of time to enjoy adrenaline filled water sports or fishing in tranquil inlets. 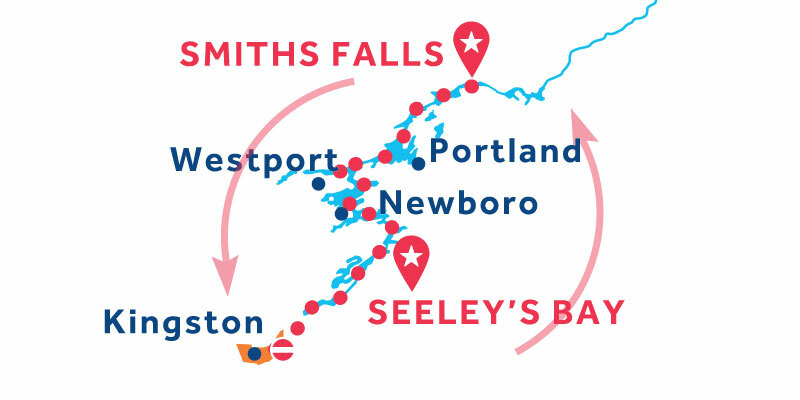 A week long cruise for those looking to discover both the small-town charm of Westport and the big city thrill of Kingston. This cruise is ideal for those looking to enjoy both the Rideau’s breath-taking nature, and unique local culture. Stopping off at Newboro and Seeleys Bay this itinerary is perfect for any budding angler looking to catch one of the region’s Largemouth Bass. For those less piscis-ly minded, this cruise also takes in the charming artisanal community of Merrickville and pulsating culture of Kingston. The perfect cruise for mixing nature, adventure and culture. This cruise will allow you to enjoy some of the spectacular nature that lines the Rideau Canal, from the Otter to the Osprey, as you make your way to Ottawa. Here, you’ll be able to take in all that Canada’s capital has to offer before gently making your way back to Smith Falls for a second chance to spot any animal you may have missed on the way up! Manotick: Manotick is a charming town with plenty of restaurants and shops to keep you entertained. A highlight is Watson’s Mill, a fascinating working museum that is one of the only remaining grist mills in North America. Ottawa: Canada’s capital has at its center Parliament Hill, with grand Victorian architecture and museums like the National Gallery of Canada, with noted collections of indigenous and other Canadian art. The park-lined Rideau Canal is filled with boats in the summer. Historic Byward Market and old town is near the canal and offers a wide choice of restaurants, shopping and outdoor entertainment. An epic one-way long break for those looking to truly immerse themselves in Canada. Travel from our base on the central Rideau in Smiths Falls up to Canada’s capital Ottawa in the north, then head south across vast Lakes to Seeley’s Bay on the Southern Rideau. The perfect getaway for those who want to explore the Rideau to its fullest. Burrits Rapids: Tie up at Burritts Rapids Lock Station, then take a walking tour of the village and experience early Canada through centuries old heritage buildings or walk the "Tip to Tip Trail", a 2 km nature walk. Manotick: Merrickville is Canada’s prettiest village. The village center consists entirely of picturesque Victorian-era stone houses perched by the waters of the Rideau Canal. Merrickville is home to many local arts and craft shops, museums, restaurants and specialty stores serving some of the best local handmade ice cream or gourmet mustards on the Rideau Canal. The service was very good. Friendly and helpful staff. Nice location and new boats. Lots of fun areas along the canal to explore. Great people. Lower Rideau is perfect. Much more open water than Europe. LeBoat went above and beyond what I thought I would be getting from meticulously showing us all the things on board, how to operate it, taking us through the first lock. It was a very happy experience and I would be happy to rent again. Check in was very smooth. Everything was ready for us when we arrived. From the moment I called to book our vacation till the morning we returned the keys to the boat, we had nothing but great service. Everyone was friendly and helpful. The boat was amazingly easy to drive, after a lesson on how to drive it. We rented a double kayak and stand up paddle boat, they were strapped to the boat and ready for take off when we arrived, and our teenagers used them everyday. There were 9 of us on the four bedroom boat and we never felt like we were in each others way. We had two families and split the cost it was a very affordable vacation. No hidden costs. Leboat always goes out of their way, before, during and after the trip, to make sure the trip is perfect! The Smiths Falls trip was our 5th with LeBoat and their customer service and attention to detail is exemplary! Smiths Falls is our base on the central section of the Rideau Canal. Its central location gives you fantastic choices for your cruising route; either head north to Merrickville, 6hrs from Smiths Falls and voted Canada’s prettiest village in 2017, or head south to the Big Lakes this region is so famous for. Lively Perth, with its famous brewery, is 4.5hrs from our base and a week’s cruise will get you as far as Seeley’s bay and back. You’ll need at least 10 to 14 nights to visit Ottawa or Kingston on your boat.